To amplify murine Fc, the FWD and REV muFc primers (Subheading 2.2.) must be ordered as in Subheading 3.1.1., step 5. Fig. 2 is an example of expected results when muFc PCR products are run on a 1% agarose gel. Ligation of the resulting muFc PCR product into the pEE12 expression vector is depicted in Fig. 3. 1. Amplify, isolate, and purify murine Fc PCR product from the pSK/muFc vector using FWD and REV muFc primers, as in Subheading 3.1.2. 2. Set up two restriction enzyme digests as follows; incubate tubes overnight in a 37°C water bath. Fig. 3. 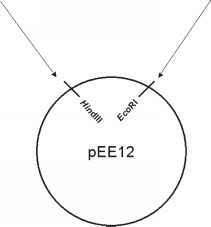 Cloning schematic depicting the generation of pEE12 master vector. Hindlll and EcoRI sites incorporated in the muFc primers are subsequently digested and used to ligate muFc (Hinge-CH2-CH3) into the pEE12 expression vector. 3. 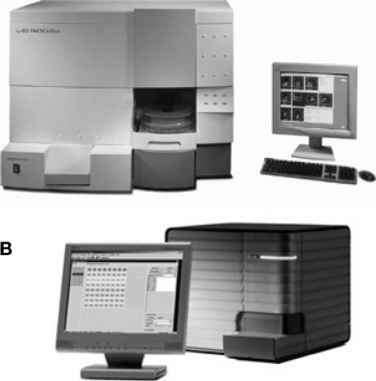 Purify digested DNA using Montage PCR filter units. 5. Heat-inactivate ligase by incubating tubes 10 min at 65°C. The resulting ligation product will be referred to subsequently as "pEE12/muFc." Transformation of pEE12/muFc into a bacterial host enables the user to amplify the vector for future use. This "master" vector can be used to generate additional Fc fusion proteins in less time because it already contains muFc DNA. 1. Thaw (on ice) 3 X 20 (L tubes of XLl-Blue E. coli. 2. Add 2 (L of ligation product from tube 1 to one tube of E. coli; repeat for tubes 2 and 3. Incubate 30 min on ice. 4. Heat tubes at exactly 42°C for exactly 45 s. Transfer tubes to ice for 2 min. 5. Gently add 100 (L of warm SOC to each tube (avoid mixing). Incubate 1 h in a 37°C bacterial shaker set at 150-180 rpm. 6. Spread contents of each tube onto a fresh LB/ampicillin plate. Once dry, invert plates and incubate overnight. 7. Record the number of colonies appearing on each plate. Tube 1 should yield few or no colonies, whereas tube 3 should yield at least twice the number of colonies as tube 2 (see Note 6). 8. Aliquot 5 mL of LB/Amp into each of 11 capped round-bottom tubes. 9. Using a sterile toothpick, inoculate a tube of LB/Amp with bacteria from a single colony from the tube 3 plate. Repeat for an additional nine colonies. (Add no bacteria to the last tube; this negative control verifies that LB/Amp is sterile.) Tube caps should be loose, but secure. 10. Incubate tubes for 8 h in a bacterial shaker set to 37°C. 11. Shortly before retrieving bacterial cultures, prepare a master mix for PCR screening: 228 (L dH2O, 30 (L buffer, 12 (L FWD muFc primer, 12 (L REV muFc primer, 12 (L dNTP mix, and 6 (L Vent polymerase. Aliquot 25 (L into each of 11 thin-walled PCR tubes. Keep on ice. 12. Pellet bacteria in culture tubes (spin 5 min at 2000g in a tabletop centrifuge). 13. Use a sterile pipet tip to inoculate PCR aliquots with pelleted bacteria from each culture. (The remaining PCR tube is a no-template control.) Repeat Subheading 3.1.2., steps 3-4. The results should mirror those depicted in Fig. 2. Meanwhile, store bacterial pellets at 4°C. 14. Purify pEE12/muFc vector from muFc PCR-positive bacteria using Wizard Plus SV Miniprep kit. Discard bacterial pellets yielding no PCR products in biohazard waste. 15. Verify muFc sequence within the pEE12 vector: submit the required amount of purified plasmid plus FWD muFc primer to an institutional DNA sequencing facility or private sequencing company (e.g., SeqWright, Sequetech, or Genewiz). Use MacVector or DSGene to align the resulting sequencing data to the pSK/muFc vector map.